We are honored to be featured on this blog, because c'mon, WHO WOULDN'T!! Stop the presses! (or should I say, letterpresses?) Our holiday poster was featured on FPO. We are honored to be featured on this blog, because c’mon, WHO WOULDN’T!! 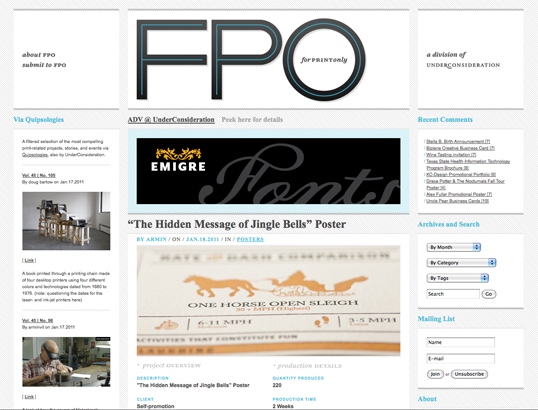 A bit of background, FPO (For Print Only) is a division of Under Consideration, a network dedicated to the advancement of the graphic design profession. FPO is a blog in which brilliant designers Bryony Gomez-Palacio and Armin Vit feature print work that shows print is not dead or on its way to extinction, and in fact can surprise us when designers really understand it and take it to new heights. Want your own poster? Click here.